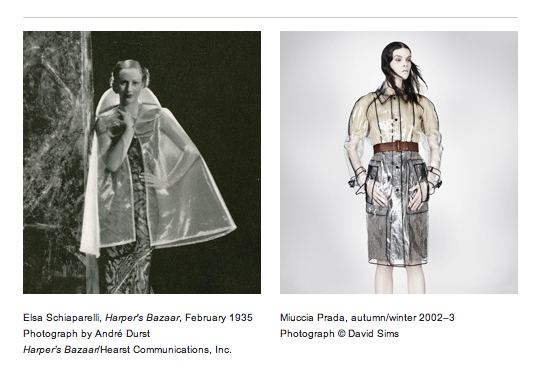 The new exhibition at the Metropolitan Museum of Art, Shiaparelli and Prada: Impossible Conversations, takes a look at two, female, Italian designers who have revolutionized the world of fashion, and through juxtaposition encourages a new reading and interpretation of both their designs. The show was inspired by Miguel Covarrubias’s “Impossible Interviews,” a series of caricatures featuring unlikely pairings of public and political figures which appeared in Vanity Fair throughout the 1930s. The Met exhibition will display some of Siaparelli and Prada’s most famous and influential designs alongside videos, directed by Baz Lurrmann, that simulate conversations between the two women which examine how each explored similar themes in their designs despite coming from very different approaches. The exhibition will be divided into seven galleries, each focusing on one topic of commonality between the designers: Waist Up/Waist Down, Ugly Chic, Hard Chic, Naïf Chic, The Classical Body, The Exotic Body, and The Surreal Body. Over ninety designs and thirty accessories will be showcased, spanning Schiaparelli’s career from the late 1920s to the early 1950s, and Miuccia’s rein at Prada from the late 1980s to the present. The show opens at the Metropolitan Museum of Art on May 10 and will run through August 19, with member previews on May 8 and 9. Judging from last year’s box office-busting McQueen exhibition, the Met’s Impossible Conversations is sure to become an instant must-see exhibit for lovers of fashion, history, and art.